It’s time again for us to visit David’s dad in Washington. This involves driving. For 15 hours. With a 4 year old and 7 year old. The only saving grace here is that we may in fact leave at like 10pm on Saturday so we get into Washington around lunch time. We’ve driven this once before with the girls 2 years ago. Sophia had just turned 3, and was newly potty trained. Nola was 5, and far less likely to sit still and amuse herself like she can now. It’s summer time … crayons are not going anywhere near the inside of our vehicles. O_O But I do have colored pencils (and a covered sharpener) and markers for them! 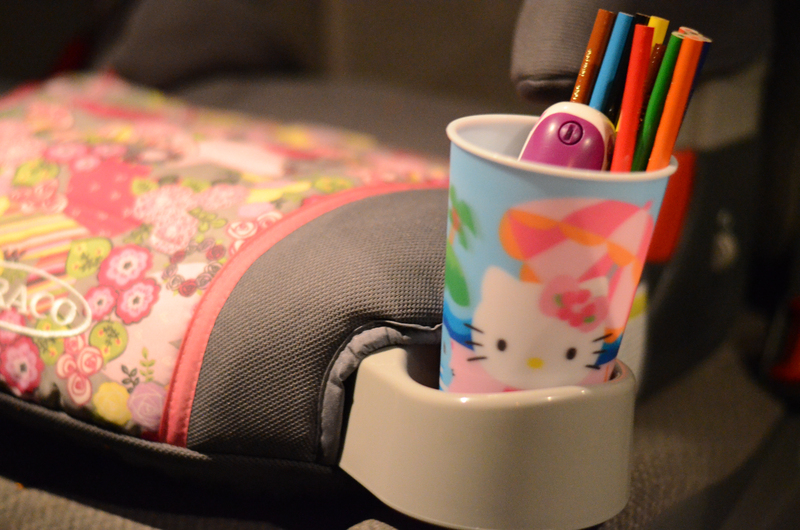 Nola’s new booster seat, and Hello Kitty cup. Target had cups in the dollar bin. I found Hello Kitty for Nola, and Tinkerbell for Sophia. Perfect! I’ve also been researching gas stations along our planned route. Gas Buddy has been quite helpful. They have an option on there to “plan” your trip, but it didn’t want to take me the route David prefers, or tell us to gas up when we felt it was appropriate (after an incident in which we ran out of gas in the Prius in Oklahoma, I’m rather a wuss about letting the tank on anything get too low). Though I was able to check and see what gas stations along our route were open 24 hours, which is hugely important since we’ll be traveling at night. I’ve since added all three gas stops into our new Garmin, because you cannot possibly over-plan such things!